Borderlands creator and franchise director Matt Armstrong has announced his departure from Gearbox Software. These days, Gearbox Software is pretty much synonymous with the Borderlands series, and after the spectacular failures of Duke Nukem Forever and Aliens: Colonial Marines, I'm sure they would like to keep it that way. So, it does make us worry a bit that in the same month that 2K Australia - Borderlands: The Pre-Sequel's developer - was closed down, the franchise creator himself has announced his departure from the company. "Things changed. No longer working at Gearbox Software. I will always love Gearbox, but it's adventure time," Tweeted Matt Armstrong, the man behind the series. 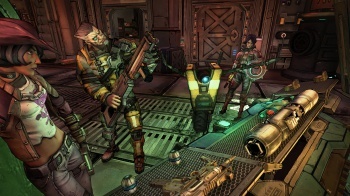 Armstrong is credited with developing the concept for the first Borderlands title and its universe, as well as acting as lead designer for the game. Armstrong also commented on the closure of 2K Australia, stating "The 2K Australia guys were amazing to work with, and there's not one of them I wouldn't work with again. Good luck, my friends." Is Gearbox ready to distance itself from the Franchise? Last we heard, Borderlands 3 is planned, and Gearbox bigwig Randy Pitchford claims it will be "the big one," but development hasn't actually started yet.